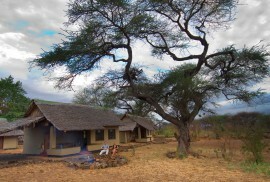 The Severin Safari Camp is located in Tsavo West National Park. 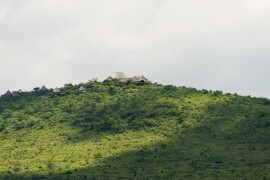 It is accessible either by regular scheduled flights from Mombasa and Nairobi or by road. 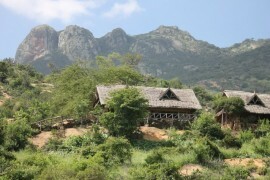 With a view to Mt. Kilimanjaro, it offers a unique landscape with vast Savannah, wooded flood plains which make it rich in wildlife like lions, buffalo, leopards, elephants and countless bird species. The hotel also lights an out of Africa camp fire in the evening where guests can unwind and enjoy the intimate time with nature. Severin Safari Camp is constructed in a stylish natural design and offers luxurious tents and suites designed in a traditional African Style. 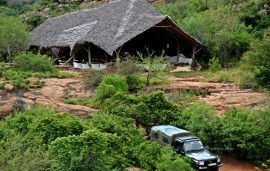 The main lounge and Thorn Tree bar overlooks the waterhole where animals come to refresh. The restaurant and bar offer exceptional services and serves all types of refreshments, coffee or tea as well as a choice of cocktails. From game drives, guests can take some time out in the spa or the safari boutique. The guests may opt to a private bush breakfast, barbecue or experience the beautiful sunset at Poacher’s Lookout with a glass of sparkling wine and canapes. A conference tent is available and can accommodate up to 30 pax. It is equipped with modern communication and presentation equipment. Internet connection is available in all areas of the camp.